Abstract. Rainfall is one of the most important aspects of climate, but the extent to which atmospheric ice nuclei (IN) influence its formation, quantity, frequency, and location is not clear. Microorganisms and other biological particles are released following rainfall and have been shown to serve as efficient IN, in turn impacting cloud and precipitation formation. Here we investigated potential long-term effects of IN on rainfall frequency and quantity. 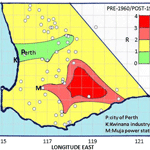 Differences in IN concentrations and rainfall after and before days of large rainfall accumulation (i.e., key days) were calculated for measurements made over the past century in southeastern and southwestern Australia. Cumulative differences in IN concentrations and daily rainfall quantity and frequency as a function of days from a key day demonstrated statistically significant increasing logarithmic trends (R2 > 0.97). Based on observations that cumulative effects of rainfall persisted for about 20 days, we calculated cumulative differences for the entire sequence of key days at each site to create a historical record of how the differences changed with time. 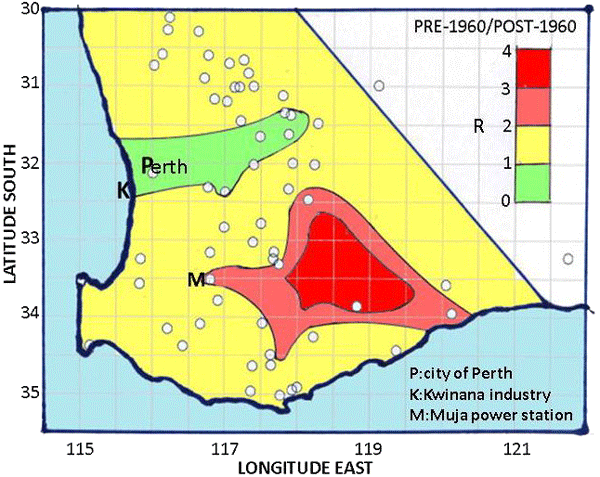 Comparison of pre-1960 and post-1960 sequences most commonly showed smaller rainfall totals in the post-1960 sequences, particularly in regions downwind from coal-fired power stations. This led us to explore the hypothesis that the increased leaf surface populations of IN-active bacteria due to rain led to a sustained but slowly diminishing increase in atmospheric concentrations of IN that could potentially initiate or augment rainfall. This hypothesis is supported by previous research showing that leaf surface populations of the ice-nucleating bacterium Pseudomonas syringae increased by orders of magnitude after heavy rain and that microorganisms become airborne during and after rain in a forest ecosystem. At the sites studied in this work, aerosols that could have initiated rain from sources unrelated to previous rainfall events (such as power stations) would automatically have reduced the influences on rainfall of those whose concentrations were related to previous rain, thereby leading to inhibition of feedback. The analytical methods described here provide means to map and delimit regions where rainfall feedback mediated by microorganisms is suspected to occur or has occurred historically, thereby providing rational means to establish experimental set-ups for verification. How to cite: Bigg, E. K., Soubeyrand, S., and Morris, C. E.: Persistent after-effects of heavy rain on concentrations of ice nuclei and rainfall suggest a biological cause, Atmos. Chem. Phys., 15, 2313-2326, https://doi.org/10.5194/acp-15-2313-2015, 2015.